From 1983, Rennes General Healthcare Center has experienced one of the first PACS worldwide, even before the production of PCs and spread of IP communication. In 1989, the laboratory “Signaux et Images en Médecine”, directed by Pr Jean-Marie Scarabin, neurosurgeon in Rennes General Healthcare Center, has launch a project of launching innovative prototypes in electronic medical imaging : PACS, 3D workstations, 3D reconstruction viewer, surgery navigation console, Magnetoencephalography MEG… A team of experienced engineers has been built to manage all those complex collaborative projects including the hospital world, the research industry and worldwide manufacturers (like General Electric, Worlwide leader in mdical imaging equipments). This team composed the European Center in Imaging for Medical Usage (CERIUM). ETIAM was founded hence the project CERIUM by this team of 5 engineers having each of them 5 to 15 years of experience in the devlopment of advanced imaging software and telemedicine application. 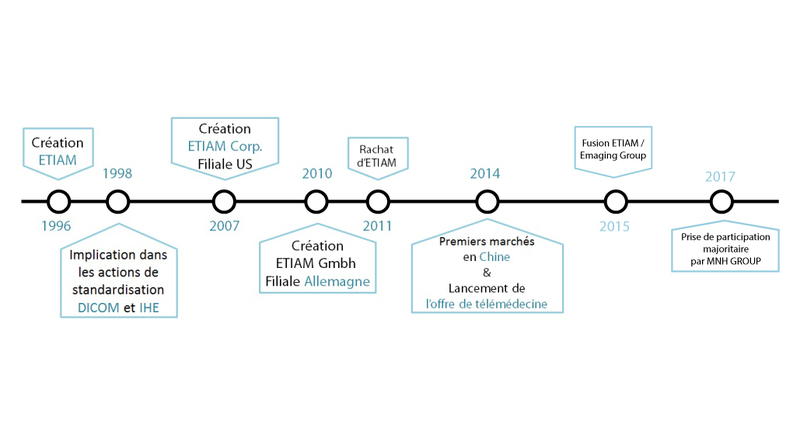 From 1998, ETIAM has accompanied its R&D efforts in products development by a strong involvement in standardisation actions, in France, in Europe and internationally, in particular around IHE. After a first step dedicated to R&D financed partially by venture capital, ETIAM insure its international development intensely (around 20% per year). From 2008 financial crisis, ETIAM has maintained its activity and consolidated its capital allowing its ambitious development from 2011 to 2013. In 2007, thanks to its strong experience of more than 10 years of indirect commercialisation in United States, ETIAM has created its subsidiary ETIAM Corp., based in the East coast in Acton. In July 2010, ETIAM GmbH was created in Germany, which hired its « Geschäftsführer » in October 2010. In United States and Germany (and in the rest of the world), ETIAM has already signed several important contracts with hospitals or groups of prestigious clinics. End of 2011, new financial investors guided ETIAM development. Eric Le Bihan is CEO, putting his experience of more than 25 years in telecom at the service of ETIAM. In 2012, ETIAM launched its offers ETIAM-Integrate, ETIAM-Publish and ETIAM-Connect. In parallel, ETIAM created a consortium with Consort NT and Covalia. In 2013-2014, ETIAM equipped Rhône-Alpes (project SIS-RA) and Ile-de-France (project ORTIF) regions with its telemedicine solution. In 2014, ETIAM launched One-Click Telemedicine, its integrated secure and real time telemedicine offer, . ETIAM hires more than 45 people including 20 computing engineers in R&D. ETIAM-Connect (National teleimaging network operated by ETIAM), beginning of 2012. More than 350 sites around the world are equipped of ETIAM Connect telemdicine solution. More than 10 millions images are exchanged each month through the telemedicine network. ETIAM has been able to put in place local, regional, national and international teleimaging centers. First sites are now equipped in Europe (Liège healthcare center) and in United States (Cleveland Clinic Foundation).